As Kobe approaches the 150th anniversary of opening its ports to trade, how about visiting the Weathercock House, Kobe's most famous foreign residence? In 2017, the city of Kobe will celebrate 150 years since it opened its ports to foreign trade. Some of the homes of those foreign traders’ homes, called ijinkan, are still standing, such as the Former Thomas Residence. Commonly known as the Weathercock House for its weathercock ornament on the roof which shows the direction of the wind, the home has a distinct architectural style and brown brick walls. Designated an Important Cultural Property in Japan, it boasts more than 300,000 visitors a year. Pay at the reception area and head inside. Admission is 500 yen, but free for high schoolers and younger. Check the homepage for other available discounts. There are brochures in English, Simplified Chinese, Traditional Chinese and Korean. Climb the stone steps to the entrance. Walk into the entryway and the reception room will be to your left. The former master of the house, Mr. Thomas, was a German trader, so he built a wooden two-storey building which adopted the traditional style of his home country. However, it is said that actually, Miya-style carpentry* was used to build the house, which is why the window frames and other features are built in a Japanese style. In addition, in order to deal with the heat and humidity of Japan, large windows were installed on each side of the house. *Miya-style carpentry is used in temple and shrine construction and repair work. Since the first floor is intended to host guests, the decor is quite elaborate. For example, the ceiling construction and the lighting structures vary from room to room, so enjoy checking out the differences. While photography is allowed, try not to disturb other visitors or move anything out of place. The south side of the first floor has a living room with a large Christmas tree, which makes it a popular place to take photos. The veranda on the south side has displays that introduce what life was like in those days. There is a spacious dining room on the west side of the first floor. The dining room has a fireplace, art nouveau-style stained glass windows and a wine cabinet that uses ice to chill bottles. Check out how the kitchen, located below, sends food up to the dining room via a lift, where it is pulled out through a small window. Look up and you will notice a massive chandelier on the ceiling. The ceiling beams and the ornamental cabinets are decorated in a way that brings medieval castles to mind. Go up the stairs and you will find the hall where a billiards table was once situated. To the left, there is a guest bedroom and breakfast nook. It’s said that once, you could see all the way to Osaka from the window. On the south side of the second floor, in the spot that gets the most sunlight, you will find the bedroom of the Thomases’ daughter, Elsa. Head back down the stairs and go to the study, to the north of the entrance. The chair and table used by Mr. Thomas back in the day is set up here, bathed in sunlight from the pentagonal windows. The back of the chair has dragon carvings. Take a look at the art nouveau caricatures and the Thomas family nameplate in the study. 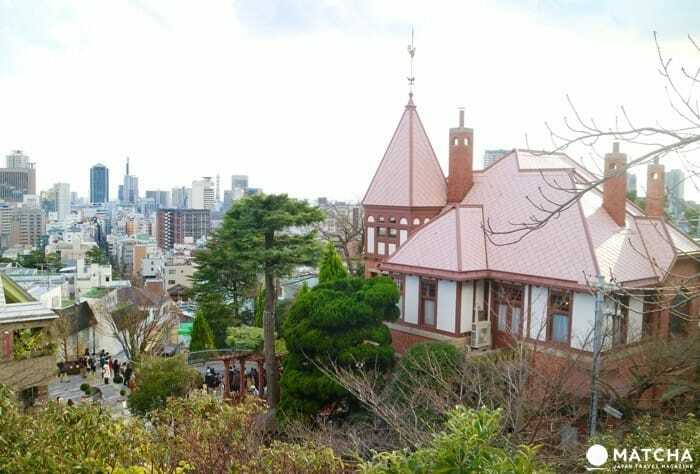 After you see the interior, drop by Kitano Temmangu Shrine to get a full view of the Weathercock House. The surrounding Kitano area was named for this historic shrine, which is said to have been erected in 1180. While there aren’t many steps leading to the shrine, they are steep, so watch your step. Take even greater care when going back down. From the shrine grounds, your view doesn’t end at the Weathercock House; you can see the Kobe cityscape and the port scenery off in the distance, and sometimes, the sound of a ship’s steam whistle will reach your ears. Doi-san of the Weathercock House had a message for prospective visitors: “Since the Weathercock House is an Important Cultural Property, it’s necessary for us to pay careful attention to its maintenance and upkeep, but we also devote ourselves to ensuring that it keeps its classic vibe. By all means, visit us to experience the halcyon days of the Meiji era. We’re looking forward to seeing you.” At the Weathercock House, hark back to more than a century ago and feel what it was like to be a foreigner living in Kobe.